In the previous post in this series we found out how fairly innocent code can cause mayhem on our User Interface (UI), locking it up and leaving the user wondering what is going on. We discovered how the Dispatcher can help us out here by queuing small requests for it to do when it can. However, I claimed at the end of the session that the model wont scale well. Well here I will try to actually prove my claim and guide you through some fairly standard functionality that you may have to build in WPF. Most of the code here is actually an attempt to display the text "Source not set" when the SourcePath is null or an empty string. //LoadImages(SourcePath); //Learning from previous experiance we use BeginInvoke instead. //LoadImages(folder);//Learning from previous experiance we use BeginInvoke instead. Images is an ObservableCollection of strings. As we modify this collection the UI should update automatically. 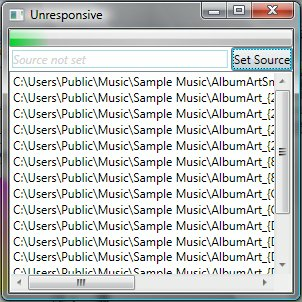 SetSourcePath_Click handles the button click and shows an Open Folder dialog box. 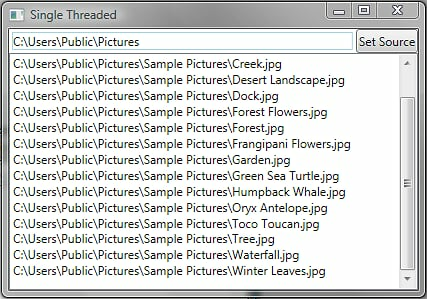 This allows the user to pick a folder to start looking for images in. IsImage method is a simple method for identifying if a file is an image. If you run this example the result is actually quite neat. Files start appearing as they are found and the UI feels responsive. However, if I pick a folder with lots of stuff in it eg: the root of C:\, the process can take quite a while. What would be nice is if I could have some kind of visual clue that tells me when it is complete, or how much is left to go, or anything! Well lets look at our code. I think the simple option would be to have a boolean property call IsLoading that is simply set to true when we are loading images. When we are done set it back to false. So we drop this new piece of code into our C# which gives us the property we are looking for. Ok. Now back to our C# code. When the SourcePath changes I want to load the images. This seems like a good place to set our IsLoading property. Hang on...when we call LoadImages we do it with a BeginInvoke method which is non-blocking. This effectively sets IsLoading to true, then back to false almost immediately. That's not right. Well lets change the BeginInvoke to Invoke. Nope that is not quite right either. Changing the initial BeginInvoke to a Invoke method call will just set the IsLoading flag for the duration where we processed the root of the source path but not for any of its sub-directories. Ok next idea.... Let's change the BeginInvoke inside the LoadImages method to be an Invoke call as well. Right that will work. We run that and it actually works quite well. I get feedback that the system is processing data via the ProgressBar and when the processing is complete, the ProgressBar disappers. the disk was under load? Well we can emulate the above scenarios by throwing in a Thread.Sleep in to our code. In my code I place a Thread.Sleep(300) into my LoadImage method at the start of the method. This represents latency of the disk/database/network. I think you may agree that 300ms is plausible value for latency on a slow network. If I run my updated code now the result is not good. The progress bar is jumpy, hovering over the button gives a delayed MouseOver effect and clicking on the items in the list is unresponsive. What have we proved here? The responsiveness of our application can be effected by external interfaces when we call them via the Dispatcher. We can achieve simple rendering effects with StoryBoards. These can be asynchronous and WPF does all the hard work to ensure a responsive UI. The UI is single threaded and performing work on the UI thread can kill UI responsiveness. The UI thread will have a Dispatcher to enable queuing of work for it to do. A Dispatcher can only belong to one thread. UI Controls are DispatcherObjects and can only be updated on the thread they were created on. Conveniently they also expose a property to the Dispatcher that owns them. You can queue tasks for the UI thread by using the Invoke and BeginInvoke methods on the thread's Dispatcher. When queuing tasks for the dispatcher you can set a priority for the task. Dispatcher.Invoke method queues a task and waits for its completion. Dispatcher.BeginInvoke queues a task and does not wait for its completion. Any task queued for the UI thread will be completed in its entirety before performing any other task. Therefore all tasks performed by the Dispatcher will cause some loss in responsiveness on the UI. 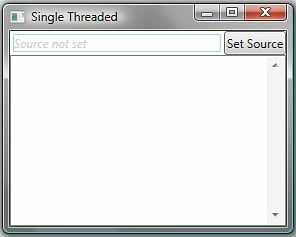 Next we discover how to perform true multi-threaded programming in WPF to really get the UI responsive in Part 4. Previous - The WPF Threading model and the dispatcher in Responsive WPF User Interfaces in Part 2.